Lindon, UT (May 10, 2011) – Footnote.com is pleased to announce the first online publishing of the War of 1812 Pension and Bounty Land Warrant Applications. 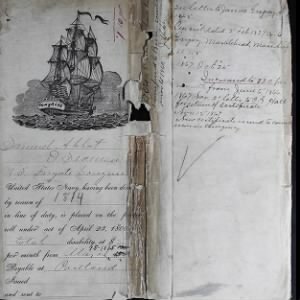 In cooperation with the Federation of Genealogical Societies (FGS) and the National Archives, Footnote.com is currently digitizing millions of War of 1812 records and making them available on its site free of charge. The initial 1,400 images are available today and the collection will continue to grow weekly as the digitization process progresses. When completed, the collection will encompass 7.2 million images that will detail the histories of soldiers who fought in the War of 1812 and their families. While the project is currently underway, its long term completion is dependent on the availability of additional funding. FGS is proud to be spearheading a national fundraising effort to ensure the completion and expedite this valuable endeavor. The organization is actively seeking donations from genealogical and historical societies, patriotic and military heritage societies, and any interested corporations or individuals. iArchives, Footnote.com’s parent company, is providing a dollar-for-dollar match of each donation through a provision of services. To learn more and contribute to the project, visit www.fgs.org/1812 or www.footnote.com/1812pensions. iArchives is a leading digitization service provider and subsidiary of Ancestry.com (NASDAQ: ACOM). The company operates Footnote.com, the leading U.S. military record resource on the web with more than 72 million records online. The site provides searchable original documents, providing subscribers with a view of the events, places and people in the conflicts that shaped the American nation and the world. For more information, visit www.footnote.com. The Federation of Genealogical Societies (FGS), founded in 1976, links the genealogical community by serving the needs of its member societies, providing products and services needed by member societies, and marshaling the resources of its member organizations. FGS represents the members of hundreds of genealogical societies and engages in projects that help genealogical societies strengthen and grow as well as call attention to records preservation and access issues. FGS can be found on the web at www.FGS.org. The National Archives and Records Administration, an independent federal agency, is the nation’s record keeper. Founded in 1934, its mission is unique — to serve American democracy by safeguarding and preserving the records of our Government, ensuring that the people can discover, use, and learn from this documentary heritage. The National Archives ensures continuing access to the essential documentation of the rights of American citizens and the actions of their government. It supports democracy, promotes civic education, and facilitates historical understanding of our national experience. The National Archives meets a wide range of information needs, among them helping people to trace their families’ history, making it possible for veterans to prove their entitlement to medical and other benefits, and preserving original White House records. The National Archives carries out its mission through a nationwide network of archives, records centers, and Presidential Libraries, and on the Internet at http://www.archives.gov/.